While waiting to push back for take off on our 10-hour flight to Thailand, I could not help but intently eavesdrop on the conversation behind us between a girl from the US and a German fellow. She was recounting to him all the places she visited in Europe in her 3-4 months there and was beaming with excitement about her remaining time left in her planned year of travel. I think what was most interesting about the conversation was her excitement of having a candid audience beside her for the next 10 hours with whom to share all her stories. I admire the people out there brave enough to travel by themselves and wonder if I myself would have the courage to do it. I’m honestly doubtful because of how lonely it could be a times. When I turned to Lauren and kissed her just before takeoff, she had no idea I was thinking how happy and lucky I was to have her by my side to share all of our experiences together. Now it’s not always roses and rainbows as there are difficulties to traveling with a spouse, partner, friend, but in my opinion sharing the experience makes everything more enjoyable. Ten hours and several time zones later we touched down in Bangkok with an appetite for some Thai food! Of all the places we have been around the world my absolute favorite cuisine so far has been the aromatic and wonderfully flavorful Thai dishes. After some Japanese food at the airport (haha) we got on the airlink train and began to make our way to Suzie’s apartment where we would crash for a night or two. Gazing out the windows on our way we both loved the change in culture we could see and were excited to start exploring Thailand. That is if we could ever make it to Suzie’s….as taxi after taxi passed us by or refused us when we told them where we were going, or at least tried to tell them. Finally we caught a nice taxi driver willing to deal with us and after I pointed out the location on his phone the navigation took care of the language barrier between us. When we arrived I think Suzie would wholeheartedly agree it was very exciting to see a familiar face so far from home! Suzie had a little vengeful surprise planned for all the times I made her treasure maps for her hidden belongings while we lived together. My credit card number was hacked while we were in Europe and finding a way to get a new card mailed to me is not easy when moving around every three or four days. Meeting up with Suzie in Thailand was the perfect opportunity to collect my new card and the perfect opportunity for her to hide it from me! She gave me clues all over her apartment I had to solve to discover the hiding place, some of which I didn’t get without Lauren’s help. Touché Suzie, but this is far from over! We all talked for hours that first night over dinner in an open-air restaurant market called the “W” not far from her place. The next day Suzie was our tour guide around Bangkok taking us to Wat Arun and Wat Pho and on our way there we found the Chao Phraya River is where the action is in Bangkok! If you get the chance hop on one of the river boat taxi’s for a ride you won’t soon forget. At each stop we literally crashed into the dock and watched the unsuspecting westerners almost go overboard. When we got on board, we followed Suzie’s lead and quickly found a seat to hold on and enjoy the entertainment. Wat Arun, Temple of Dawn, was an amazing temple to start with because of how meticulously it is decorated. There are small pieces of colorful ceramics embedded in the prangs (tower structures) that give the Wat an incredibly different appearance when up close versus far away. Up close we could see the minute details on each ceramic piece some of which looked to be broken pieces of dishes; broken with such precision to match their partners in the patterns. From far away the ceramics blended together swirling in colorful patterns around the prangs. We loved all the statues which were either demons or guards depending on their faces and feet. 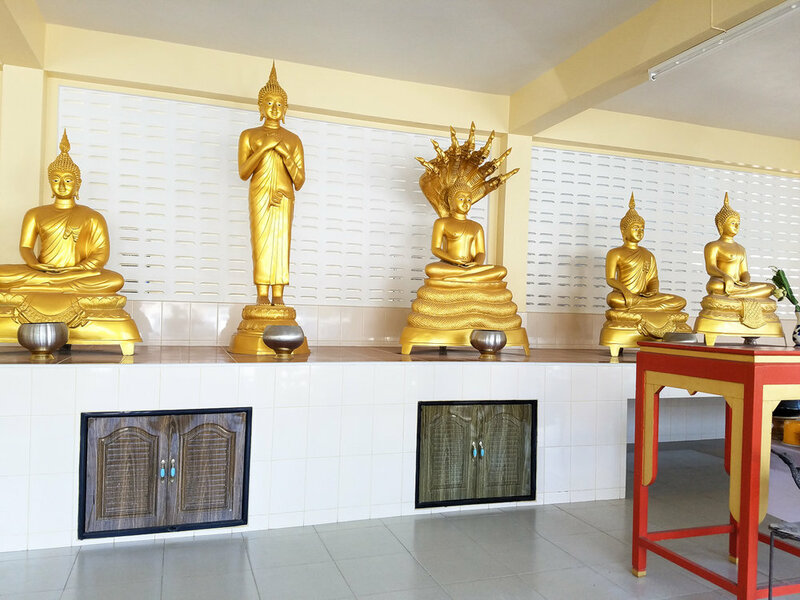 The guards protected the wat and the demons scared off evil spirits from entering. We coined a new phrase with all of the “facts” our tour guide was giving us…we called them “Suzie Facts”. We believed the majority of them, but there were 3 or 4 times that we had to question the “Suzie Facts”. 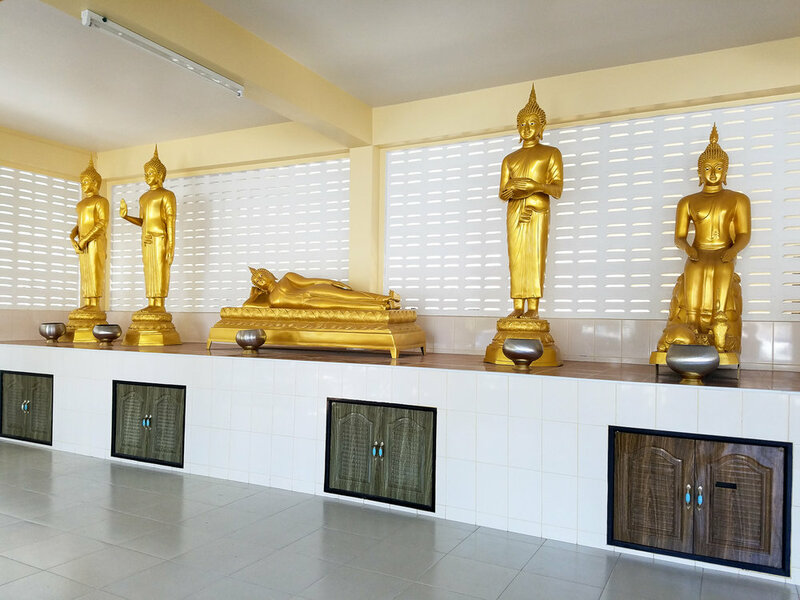 When entering Wat Pho Suzie told us we were about to see the largest reclining Buddha in all of Asia. The Buddha was certainly massive and we enjoyed marveling at the size and wondering what he was made of. She was close this Buddha is definitely on the list for largest in Asia, but the record holder is in Myanmar. We ended our day tour of Bangkok at Asiatique for dinner and a rousing game of Levis shirts. For those of you who don’t know how to play it’s a simple game of who can spot the most Levis shirts during the day. Lauren noticed long ago in Europe how prevalent the shirts are and we have been playing the game all over the world for the last several months. Give it a shot with your friends it’s actually a lot of fun! A quick aside about Bangkok. 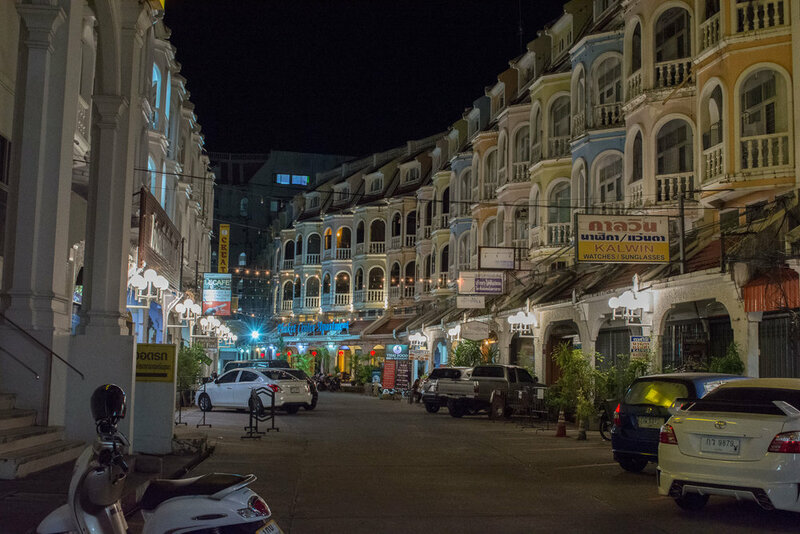 Just about anywhere we walked the streets of Bangkok there was contrasting wealth and poverty side by side. There is not a section of the city where the wealthy elite live separated from the working class. It is as if the city was a stew with the rich and poor thoroughly mixed together on simmer for many years. Another interesting contrast we could not help to notice while walking the city were the smells. One second we would be filling our lungs with the sweet smell of delicious Thai cooking and in the next coughing out the repulsive smell of sewage wafting by. 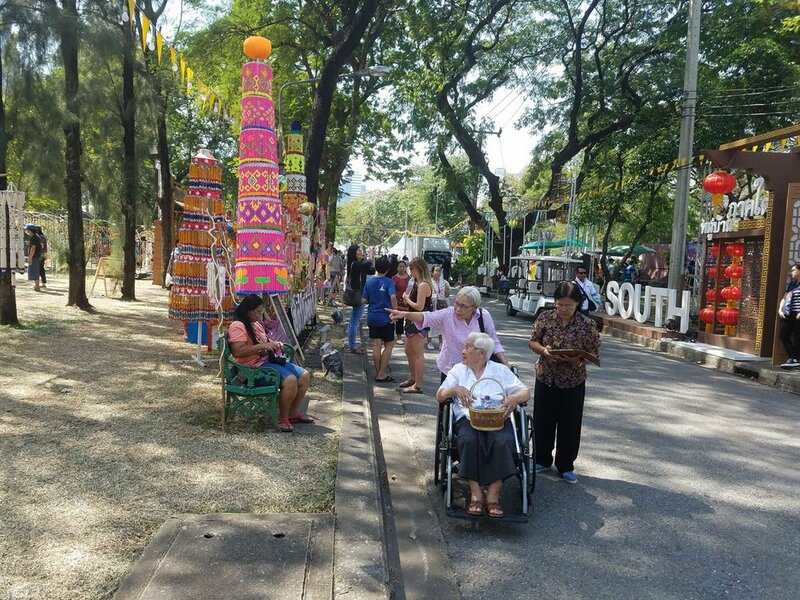 On Saturday we went out again with Suzie to Lumphini Park to try and see some of the huge monitor lizards that hang around there, but instead found a festival in the heart of the park. The festival was split up into different sections in the park representing all of the different cultural regions of Thailand. As we walked around the succulent aromas from the many food stands made our stomachs growl reminding us of the dinner plans tonight with Suzie’s friend Chelsea for her birthday. We had lost track of time and were now running late so we jumped on the BTS (elevated metro) and then Suzie put us on our first mototaxi for a race back to her place. Forget roller coasters if you want a thrill just hop on the back of a mototaxi in Bangkok during rush hour and hang on! These guys were snaking through traffic in the literal sense, weaving back and forth around the cars so close that a stray elbow would clip a side mirror! Suzie gets a ride from these guys every day on her way to school….a great alternative to coffee. 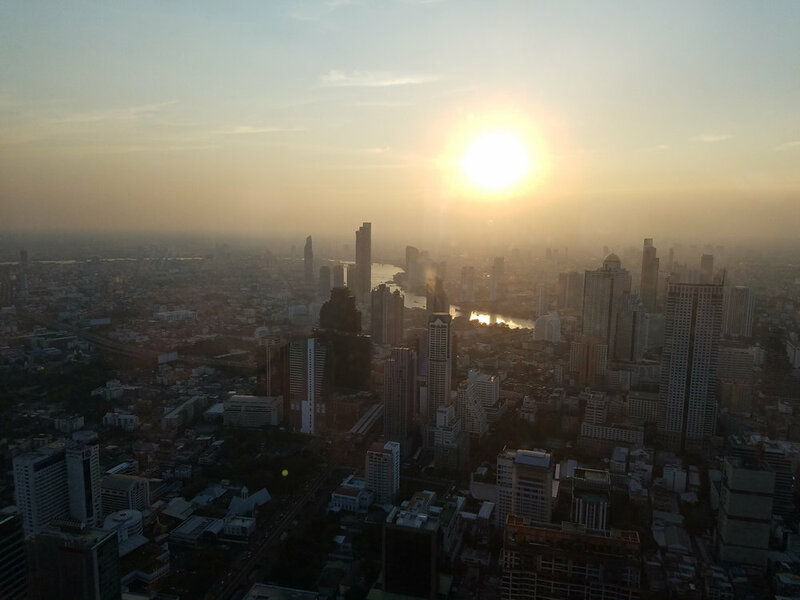 We made it just in time for sunset drinks on top of the tallest building in Bangkok before dinner. The view of the city was impressive and made us question if we really were in a third world country with all this wealth around us. After dinner everyone in the group looked to Suzie as the club expert for good drinks and dancing since she was the only one living in the city. The first club was a speakeasy and supposedly a secret. When we walked in some douche at the bar even said how the hell did these people find this place? Sorry dude didn’t realize you were so territorial over where you drink your alcohol, maybe you would prefer a closet in your house if you don’t like other people around you. Other than that, the place was very chill and had great drinks to pregame for the next club where the dancing was at. I don’t actually know the name, but I will call it club FOGGG for how many fog machines they had hosing down the dance floors. We danced at this club for most of the night and only realized how late it was getting because most of the group had disappeared. Three in the morning was the latest we have stayed out partying in quite a long time and we payed for it the next day! 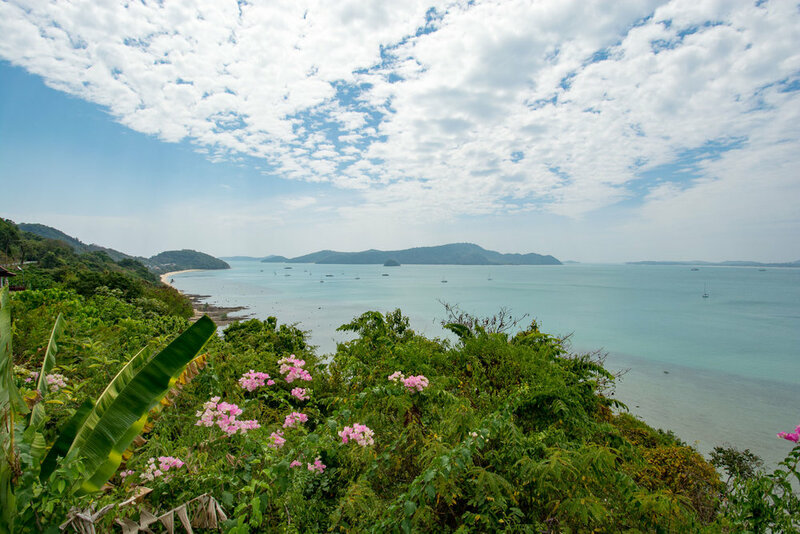 We knew before going to Phuket that it would be a very touristy place which is not our preference and so our strategy was to find the remote beaches not packed with people. To get to these beaches we would need a means of transportation which fortunately in Thailand has a simple answer, scooters. We could not agree on who would drive so we simply rented two scooters which was the best decision we made with how crazy the roads were! It was the number of other scooters and cars on the roads that made the experience a white knuckle one. What Buddah do you feel like today? After the first hour on the scooters we both grew more confident on them and really enjoyed our freedom to scoot around wherever we pleased. A sight that did unnerve us for a while was when we saw one guy pull a U-turn too fast and flip over his handle bars in the middle of the highway where everyone was going about 40mph. Of course, he didn’t have a helmet and looked quite dazed when trying to stand his scooter back up to hop back on. Fortunately, there were some locals that stopped along with us to get him off the road and make sure it was okay. 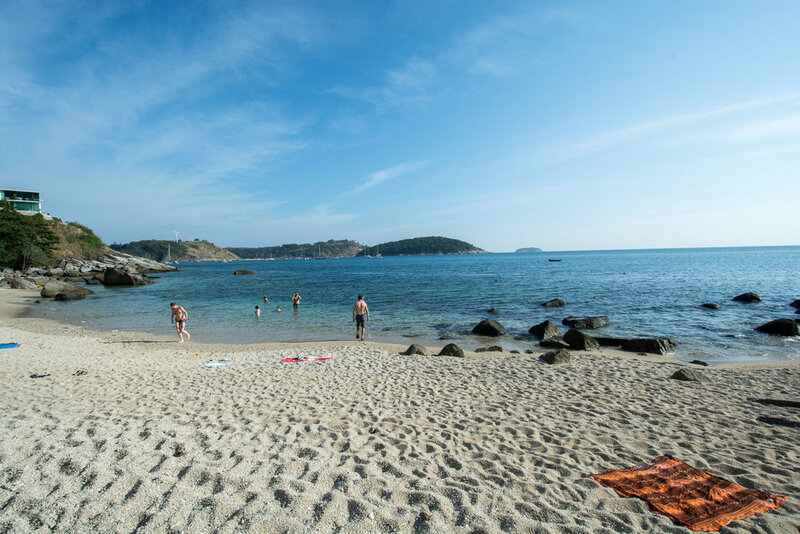 We started at a beach only about 15 minutes from Phuket town called Ao Yon which was a great find with only a handful of other people on the beach. 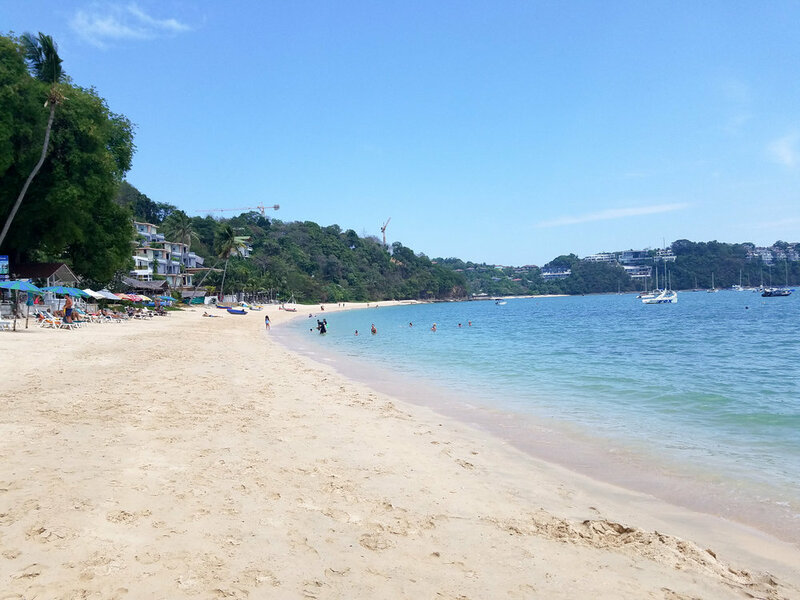 This beach may not have had the most beautiful view and clearest waters on Phuket, but it was certainly nice to have our own private section of beach for a couple hours. The sand was soft, and the blue water was warm yet refreshing which made it a great place for a swim and soaking up some rays. We left the beach only because of how loud our grumbling bellies were getting. OMG remembering our lunch on this day I just started drooling. We rode to Pure Vegan in an area of Phuket that had several Muay Thai fighting gyms around. As we ate an incredible lunch we watched the scary fit and insane people running up and down the street in the heat of the day. I had the Mexican bowl which was so amazing when we went back the next day for lunch, I had the same thing! Ugh so good!!! After lunch we rode to the south tip of the island to another beach called Ao Sane. This is a very small beach and quite rocky but has extremely clear waters and great snorkeling! 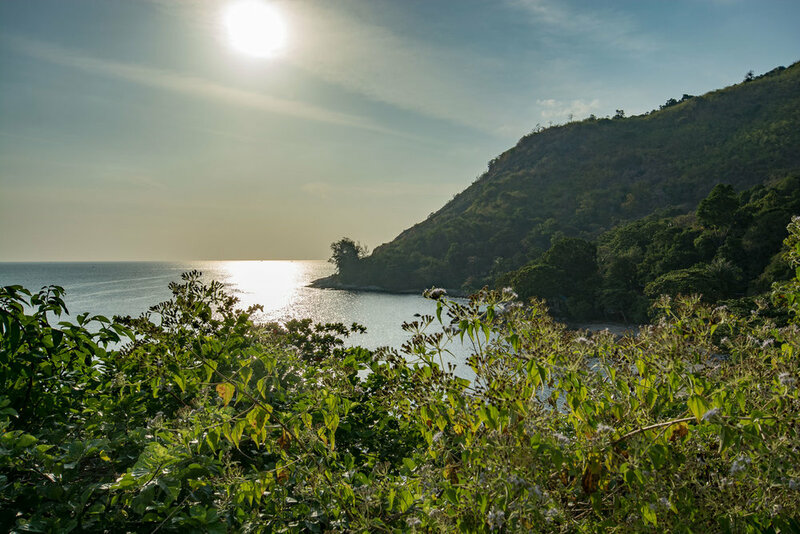 We didn’t go snorkeling on our first day there, but we came back the following day because of the outrageous price the longtail’s were extorting to go to Ko Bon Island just off the south coast. There is a restaurant on the beach where a woman rents snorkeling equipment for a very reasonable price. I think it was 100 baht for a couple hours which is about $3 US.